I steered off course a little doing my room makeovers, I’m supposed to be working on guest bedroom #2, but I’m back on track now. 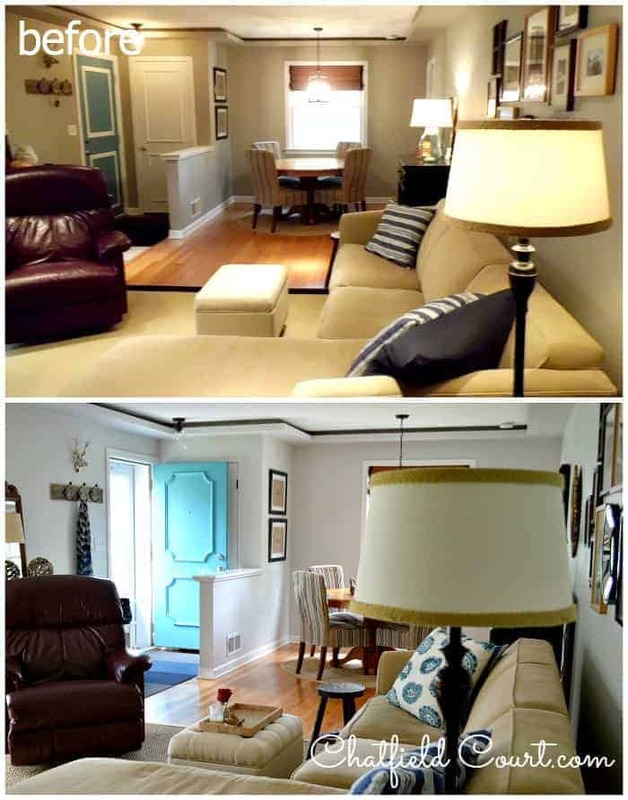 After the long and miserable winter we had, I just couldn’t stand how dark the living room was. I painted it BM Thunder last November and, although I knew it was bit dark, it seemed like it would work. Well it didn’t. The room faces North so it’s on the dim side anyway and we had not gone through a winter in this house so I had no idea how the color would hold up. I finished up the 1st guest bedroom and just dove into repainting the living room. I ended up choosing BM Gray Owl, at 50% strength. I had used Gray Owl in the bathroom and loved it so I thought I’d give it a try. I ending up having to paint the hallway and the living/dining/entry. I found this picture on my phone. It’s definitely not the best quality but you can really see how much lighter the Gray Owl is compared to Thunder. I have to say that I wasn’t loving it when it first went on but I think I like it. Does that sound convincing? 😉 Of course it doesn’t look the same as it does in my bathroom because the lighting is so different but the room is definitely lighter and brighter. I am also liking my new seagrass rug better than the black bordered rug. 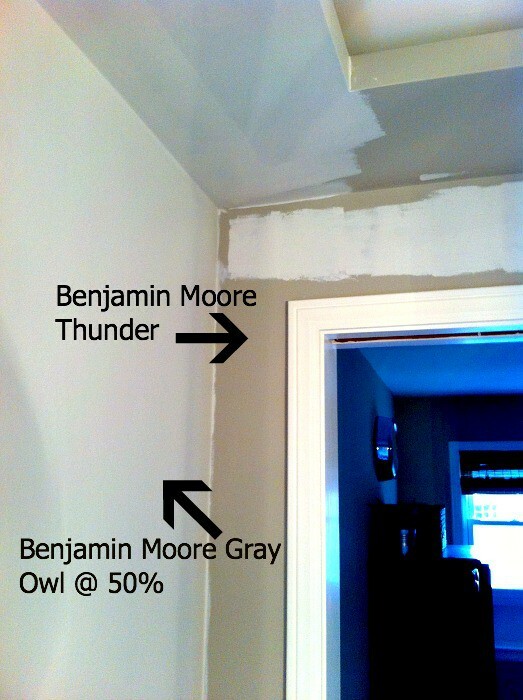 Here is my hallway painted with the BM Gray Owl (50% strength). I do love how it looks in this space and how it works with MS Plumage in the guest bedroom. I think that the one thing that bothers me is the media cabinet. I’m not quite sure I like the color of it against the new paint. I would love to hear what you think. Should I leave it as is or paint it a different color? Any ideas? I love the lighter color and before reading the other comments was thinking navy for the cabinet. If it were me I would just paint the drawers and doors blue first to see how that looks and then paint all of it if needed. I would make the pulls a gold color, too. Hello I just started reading your blog and I am really enjoying it. The living room looks great with the new wall color. 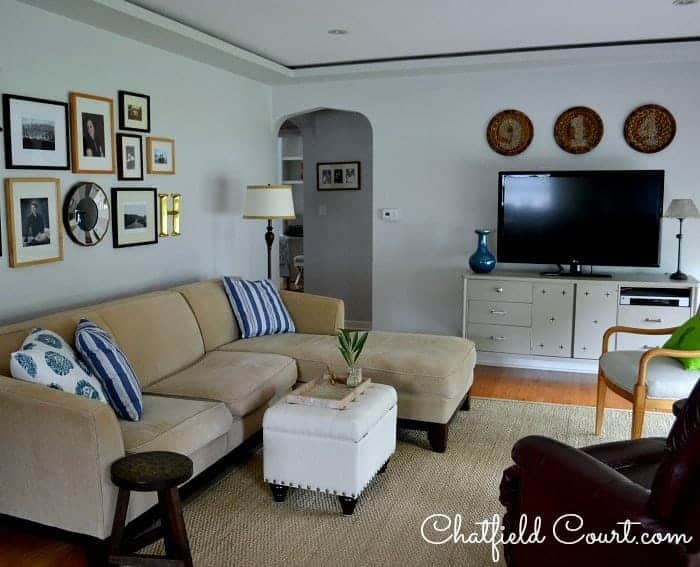 Love the furniture, rug, pops of blue and all of your accents. Personally I would paint the tv hutch black. 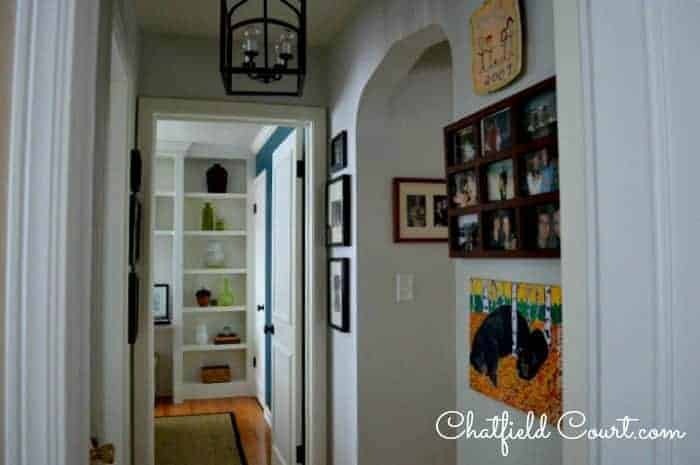 It looks like you have a piece already painted black on the other side of the room and by painting the hutch black, it will balance both rooms. I’m sure whatever you decide it will look great. Looking forward to following along on your decorating journey. The blue for the media cabinet is a good idea. It would pull in the blue in your throw pillows and how about bringing some burgundy and blue covered pillows to pull together the burgundy chair. Sounds like it may be disappearing soon, so there wouldn’t be too much spend on items with that color. 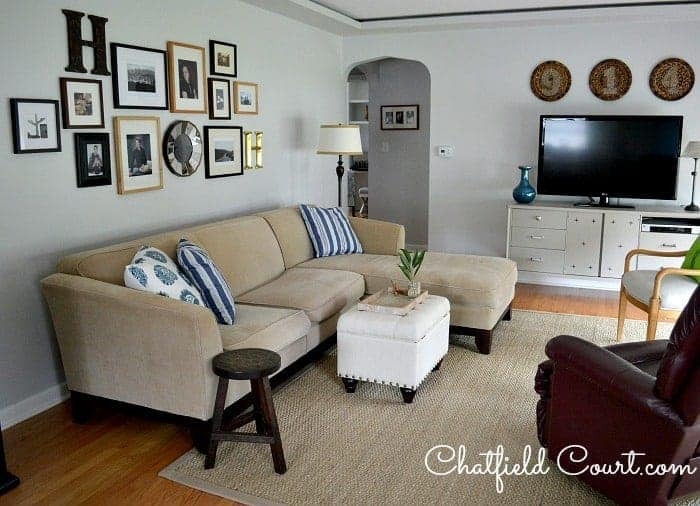 I think you need to treat your sofa and rug as a neutral instead of the focal color and use greys and blues to tie in the new wall color. Definitely paint the media cabinet in a blue, maybe similar to the blue I see in your throw pillows. Hope my suggestions help, but you have to decide on your own what really will work for you. I think it is great getting some brainstorming from other people and sometimes it gets you to thinking about other ways to decorate and color choices! BTW, love your blog and your decorating ideas have been helpful to me. I actually liked the old wall color too! I am going to ditto the other comments and suggest a bold color for the media cabinet, I like the blue idea! Thanks Kelly. I think that blue seems to be the unanimous choice. Thank you for your input. Love your room & the new wall color! I think a bit more balance in color is needed. I would paint the media cabinet something bolder. I love the paint colour and agree the media centre needs to be changed. 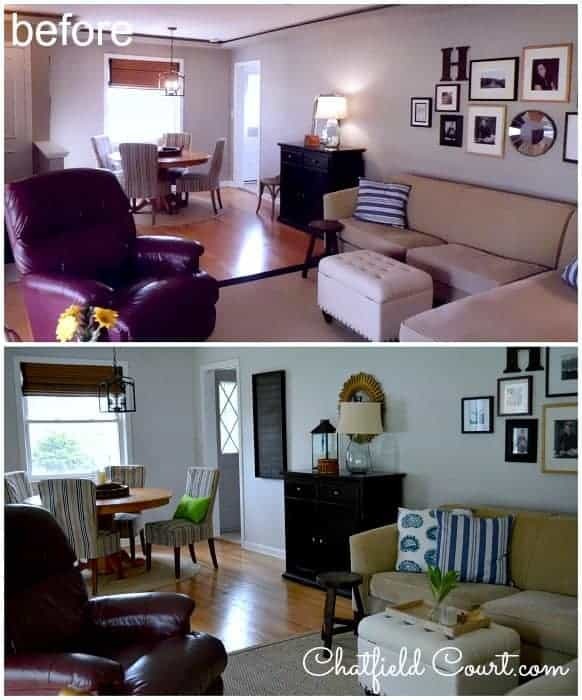 With the wall colour and the big couch being light, I would probably go darker – something similar in darkness (although not necessarily the same colour) as the dresser between the living and dining room. Thanks Al. It seems everyone says the same thing and it seems I will be getting my paint brush out again. 😉 I appreciate your input. I like the new paint color and the blue accents in the room. What about painting the media cabinet blue? Visiting from Inspire Me Monday. The new paint looks good! The media cabinet does look a little dingy next to the new paint though 🙁 just a few shades darker or lighter should fix it. I changed my living and dining color from latte which is similar to your old color, to a gray. It brighted up the rooms so much. You said your husbands recliner was a problem. Maybe paint the tv stand a color close to the color of the recliner. It won’t stand out so much. It would look like it it’s should be there. If you get a new recliner or chair, you can always re-paint the tv stand. Beautiful room! I was surprised at how much my room was brightened too. 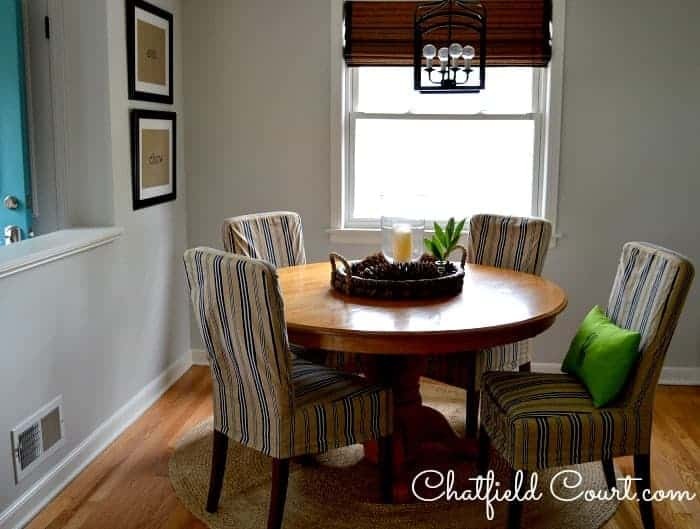 Paint color does so much for a room, doesn’t it? Painting the media cabinet the color of the recliner is something I have considered but I’m secretly pushing to get rid of the chair sooner rather than later. 😉 Thanks Noreen, for your input and for visiting.